"Breeeaaaaaaaathe. Do the combo and then take three deep breaths to slow your heart rate and get in control. Fight hard, but fight smart. You got this!" Milan briefly paused the masterful work he was doing on the bag next to me to deliver this important message. 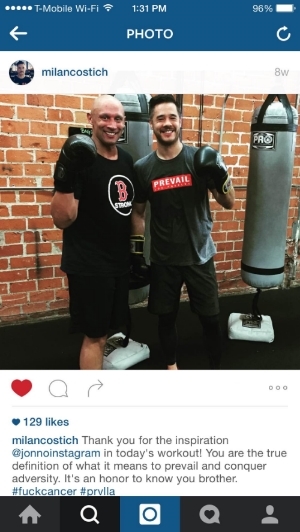 It had been 7 weeks since I last worked out at Prevail, Los Angeles, the boxing gym that has played a huge role in helping me survive cancer treatment over the past year. From day one, I knew that Prevail was a special place and was immediately hooked. I'd been grinding hard at work and was in the worst shape of my life, having spent six months or so doing half-assed 20 minute workouts on the bike or short, slow runs. I'd been an athlete my whole life and the joke of an exercise routine that I'd fallen into simply wasn't me. Thankfully, my workout inertia ended abruptly when I joined Prevail and Coaches Lolo and Milan quickly whipped me into shape. Lolo's classes were electric and Milan's humble leadership, magnetic. 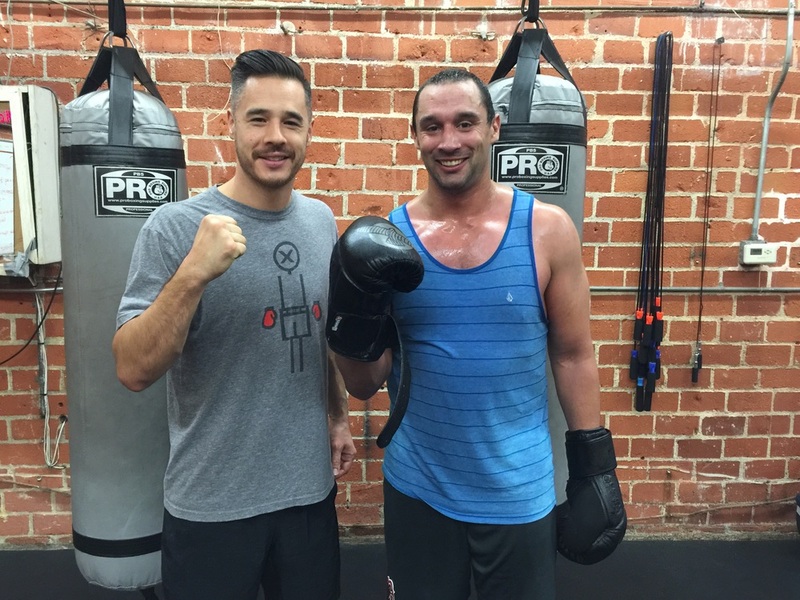 Every day, I looked forward to going to boxing (and maybe even dreamed about it a few times…) and as the weeks passed, Prevail quickly got me into great condition, just in time for the fight of my life. On September 9, 2014, I was diagnosed with late stage Hodgkin's Lymphoma and have since endured 34 rounds of chemo, 32 nights in the hospital and an autologous stem cell transplant and just started a year-long course of antibody therapy. The Prevail family has been there for me at every step of the way, cheering me on and supporting me as if I was kin. I’ve been lucky enough to be physically able to keep working out during treatment and Prevail has been part of the foundation of my life during this insanely challenging period. My return to Prevail signified my return to normalcy after each chemo session. It was liberating to sweat out the toxins, use my muscles after days of being a couch zombie and punch through the intense emotions, exacerbated by heavy doses of steroids, that come with having cancer at age 28. Prevail was one of the few places where I could completely forget that I was a cancer patient and be myself, which was a tremendous gift and made treatment more tolerable. The workouts, however, only scratch the surface of what Prevail has done for me over the past 14 months. I had been a member of the gym for only a couple of months when I was diagnosed, and despite the fact that we didn’t know each other well, Milan and Gina made sure I had Prevail gear to wear on my first day of chemo to remind me that if I was tough enough to get through the workout, then I would be tough enough to get through chemo. Each time I walked through the door after treatment (and also during treatment via text and email) the Prevail team would check in with me about how I was doing. They even put me in touch with their friends and family members who are cancer patients or survivors and referred me to doctors that had helped their loved ones. The coaching staff also watched me like hawks to make sure that I took breaks when I needed them and didn’t overdo it. And when I was hospitalized for treatment, they came to visit and walked laps with me in the courtyard with my chemo IV pole in tow. When I joined Prevail, Milan delivered the official welcome that he gives to all new members and with great sincerity said “welcome to the fam.” It's not a cliché and this greeting genuinely embodies the gym's ethos; Milan really means "welcome" and Prevail really is a "family". Milan and the incredible team that he assembled have created a world-class fitness boxing program with an infectiously positive and supportive culture. It has been a pleasure to watch the team and the gym grow from a start-up to a flourishing, wildly successful enterprise, while maintaining the quality of its product and integrity of its culture. I want to thank the Prevail family from the bottom of my heart. I am forever grateful for your generosity and support and could not have made it through the past year without you. I feel incredibly lucky to have accidentally wandered through your doors in July 2014 and am thrilled to finally be back at Prevail on a regular basis. The Prevail family is truly the best. Thank you so, so much. March 2015 - Celebrating finishing 6 months of AVBD by sweating it out at Prevail surrounded by positivity and good vibes. April 2015 - hanging out with the Prevail Team at the Nike Women's LA event, which was one of the most fun nights of my life. April 2015 - the day before I started IGEV, leading up to the stem cell transplant. Once again, Prevail has my back! July 24, 2015 - My 29th birthday and 6 days before my stem cell transplant. September 2015 - FINALLY back at Prevail. 11/19/15 - back at Prevail, with a head of hair and eyebrows!